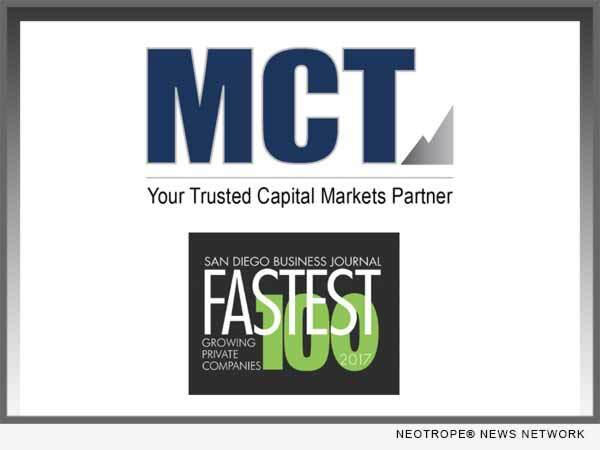 SAN DIEGO, Calif. /California Newswire/ — Mortgage Capital Trading, Inc. (MCT), a leading mortgage hedge advisory and secondary marketing software firm, announced that it has again landed on the San Diego Business Journal’s (SDBJ) 2017 Top 100 Fastest-Growing Private Companies list. MCT ranked number 72 on this year’s list, with a with a three-year growth rate of 81.88 percent from 2014 – 2016. Companies that made the list were honored at an awards ceremony held at the Paradise Point Resort and in San Diego, California. MCTlive! (TM) has been instrumental in the company achieving unprecedented growth over the last few years, with lenders of every size now using the solution to efficiently manage various capital markets functions for secondary marketing departments. Mortgage Capital Trading, Inc. (MCT) is a capital markets-focused risk management and advisory services company providing independent analysis, training, hedging strategy and loan sale execution support to clients engaged in the secondary mortgage market. Founded in San Diego, California in May 2001, the company has expanded to include field sales and support offices in Philadelphia, Dallas, San Francisco, Los Angeles and Charlotte. MCT is a recognized leader in the industry and currently supports more than 150 clients on the HALO (Hedging And Loan sales Optimization) Program. The company also develops and supports MCTlive! (TM), an award-winning real-time, trading and best-execution secondary marketing platform. MCT’s LockCentral(TM) is the industry’s largest outsourced centralized lock desk service. In addition, MCT offers a suite of tools and supporting guidance for MSR needs. For more information, visit https://mct-trading.com/ or call (619) 543-5111.